Marriage of Stephen O'Mara and Osra O'Dwyer, 1942. From Irish Press, October 24, 1942. (todo) see mar of Osra O'Dwyer, [GROI] 3rd qr 1942, Dublin South, vol 2 p 637. Stephen's uncle Fr.Paddy did the wedding. They lived "Monaleen", 3 Neville Rd, Rathgar, Dublin. Listed there in [Thom's]. at least 1945 to 1951. 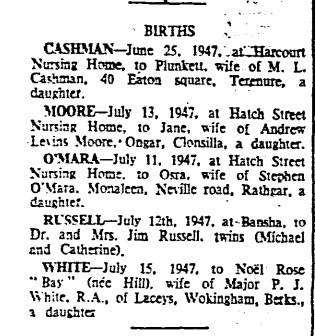 Listed there at dau's death in 1953. Stephen took over running the family firm, Donnelly's bacon factory, Dublin. 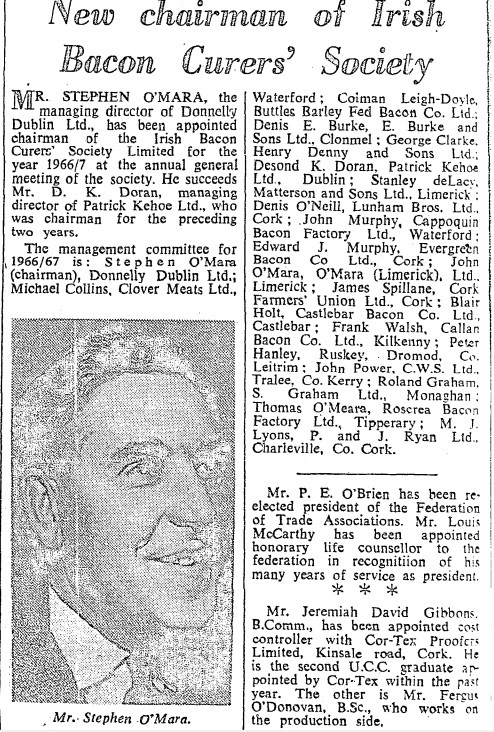 Managing Director of Donnellys from at least 1958 until it closed 1967. The company was making a lot of money. Spent a lot of money on a new building c.1962-64. Stephen was trying to retire from running it. A manager took over running it. Stephen was still Managing Director of Donnellys in 1966. See item in Irish Times, 28 June 1966, p.10. Donnelly's got into financial difficulty and went into liquidation 1967. Stephen set up a business in Wicklow making plastic fireproof doors. Lived "Monaleen", Torquay Rd, Foxrock, Co.Dublin. Listed there in 1969. Listed there in [Thom's] at least 1973 to 1977. Gone by [Thom's, 1987]. In old age they were both in a home in Killiney, Co.Dublin. funeral 23 Oct, bur in Glasnevin. funeral 2 Sept, bur in Glasnevin. funeral Mon 26 Oct, bur Glasnevin. James O'Mara, mar Kate ---- and had issue. 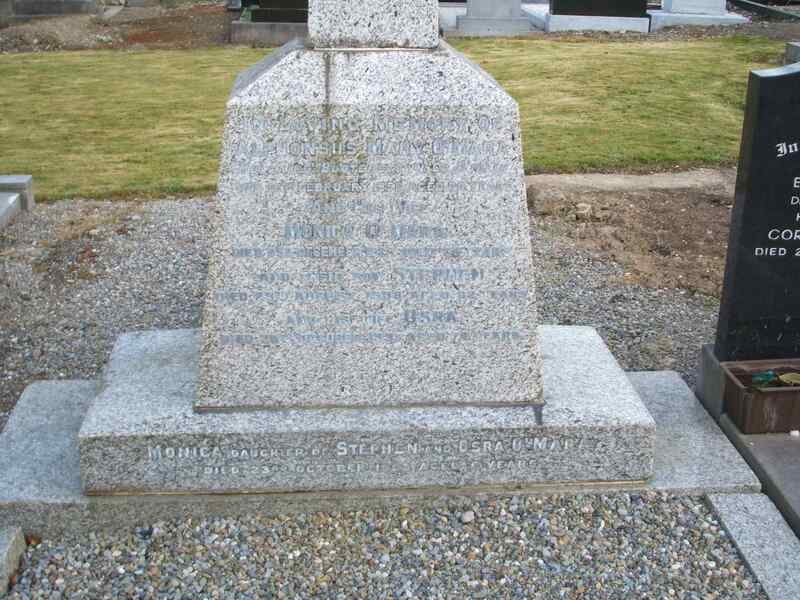 Grave of Stephen O'Mara and Osra O'Dwyer (and Stephen's parents), Glasnevin. Photo 2006. See full size. Photo courtesy of Richard Humphreys.